Oxford, Mississippi is a town known for its charm. Named by USA Today as one of the top 6 college towns in the the nation and included in the Best 100 Small Towns in America, Oxford is a town rich in heritage and possibilities. 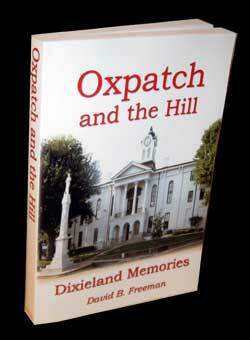 Oxpatch and the Hill – Dixieland Memories, written by Oxford native and author David Freeman, showcases a period in Oxford’s history when its small town atmosphere prevailed. Freeman’s stories are based on his personal experiences growing up in Oxford and nearby College Hill during the 1950s and 1960s. Seen through the eyes of child, a teenager, and a young man, Oxford is a place filled with fond memories, family closeness, enduring friendships and endless adventure.